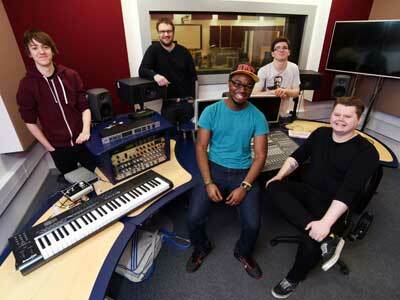 Getting into the music industry can be a tough gig, but our music technology degree gives you a foot in the door. You perform in and run recording studio sessions. You create, produce, mix and master stereo and surround recordings. You perform and engineer live performances, programme sound synthesizers, set up and run student-led projects, including a record label, promotion events or radio station, and create and dub music, sound effects and Foley to video and other media. You get involved in some exciting stuff using the latest state-of-the-art equipment and facilities. You explore a range of compositional and production techniques from harnessing the vast array of creative options offered by audio and musical instrument digital interface (MIDI) sequencers. You develop the necessary skills, knowledge and understanding to capture, edit, arrange and process audio and MIDI programme material from a range of sources. You achieve this through creative exercises and experimenting in music production using digital audio workstations (audio/MIDI sequencers) with MIDI controllers and keyboards in dedicated music labs. You learn about the principles and discuss applications in lectures and demonstrations. In facilitated IT laboratory sessions you practise techniques and applications. Audio and MIDI sequencing has a practical assessment and a creative music production assignment. You explore the theory of audio engineering – specifically mixers, balanced lines, phantom powering, sound quality, signal levels, metering, compressors, noise gates and equalisers. You also examine the functionality of the various components of audio and musical instrument digital interface (MIDI) sequencing applications, and the relationships between them. You explore the advantages and disadvantages of recording MIDI performance data, compared with recording audio signals through a thorough examination of the MIDI specification. You are introduced to digital audio theory and its relevance to music production and sound engineering. You learn about the principles and discuss applications and, in facilitated IT lab sessions, practically apply the theory. You are assessed by two question papers. There are two themes in this module. The first is to develop your verbal and written communication skills through investigations into the relationship between music, technology and popular culture. The end result is a written essay and an individual presentation to your peers. The second theme is production, or part production of a group project or event, where you develop personal and teamwork skills and explore issues relating to creating cultural events. You consider and find solutions to the practical issues of teamwork. Weekly facilitated meetings provide the framework for the main themes. Tutorials explore issues and examine real-world problems. Lectures introduce contextual concepts and relationships between music and technology. Tutorials develop your academic writing and presentation skills. Facilitated group workshops develop group-working practices and events management techniques as you work together to formulate the details of a public event and its practical implementation. Context assessment is by individual presentation and essay. Events assessment is by a blog portfolio documenting group work. There are two themes in this module. The first is to gain an understanding of music theory for careers in music technology, and to facilitate musical communication within the composition and production processes. You take part in a series of facilitated music lab sessions and practical exercises using a number of music production applications with MIDI controllers and keyboards. The second theme is composition, where you consider the application of the earlier music theory sessions. You apply your knowledge and skills to create original musical work, with reference to chosen artists. Lectures explain the principles and discussion of applications, and provide guided technical solutions. Laboratory sessions give you the opportunity to practise suggested techniques. Music theory assessment is by practical assessment and composition is assessed by assignment. The recording of acoustic and electroacoustic instruments requires the acoustical separation and high quality monitoring of a professional purpose-built recording facility. You develop the necessary skills, knowledge and understanding to capture acoustic and electroacoustic instruments, such as the voice, drums and guitars in professional, state of the art recording studio facilities. You cover microphones, mixers, digital audio workstations, analogue and digital signal routing and capture, establishing, maintaining and assessment of signal quality, patch-bays, gain structure, instrument specific and stereo recording techniques, metering, acoustical separation, monitoring, creative and corrective signal processing, and recording studio practice. You participate in demonstrations, practical exercises and timed sound engineering challenges. You are assessed by a series of practical tests to demonstrate studio competence and recording engineering challenge. Lectures provide you with explanations of principles and discussion of applications and guided technical solutions. You take part in studio sessions to practise suggested recording techniques. You learn by demonstrations and facilitated hands-on participation in practical exercises and recording sessions. You are assessed by a practical exam and assignment. You explore the theoretical and practical relationships between sound in air (acoustics), the perception of sound (psychoacoustics) and audio signals (electroacoustics). Time (waveform) and frequency (spectral) descriptions of sound are offered and the relationship between the two is investigated. You are also introduced to acoustic ecology to examine the relationships between yourselves, sound and the environment and to improve their sonological competence. The importance of hearing conservation is stressed throughout. You are assessed on your understanding of acoustic principles, acoustic ecology, electroacoustics and perception. Your lectures provide an explanation of principles and discussion of applications. Your tutorials provide guided solutions of relevant examples and IT laboratory sessions explore the analysis of sounds. You are assessed by two assignments. You explore the context and concepts of a particularly unique genre of music. You develop your understanding of the genre, and explore your creativity in electroacoustic music compositional and production techniques, specifically those techniques made possible by contemporary digital audio workstation sequencing applications. You explore the context, concepts and techniques associated with electroacoustic music, and you focus on developing intellectual understanding and openness to the musical concepts of the genre. The contemporary analogue compositional techniques of electroacoustic music are reworked in the context of modern digital audio and in creating original compositions. Lectures and demonstrations explain concepts of extant work, principles of composition, discussion of applications and provide guided technical solutions. You take part in facilitated practical exercises in the music labs and explore the concepts and practise suggested compositional techniques. You are assessed by two coursework components with compositional and written elements. You develop your technical and organisational skills in live sound production in the context of working for clients as a team in a suitably equipped music venue. You use a range of techniques including microphone placement, artist monitoring and PA systems, live mixing and signal processing in live sound environments. You study a range of technical topics relating to venue characteristics, speaker systems, analogue and digital signal routing, and the health, safety and legal issues relating to the live performance environment such as sound levels and electrical considerations. You also focus on issues relating to organising and running a range of live events individually, in cooperation with clients. Lectures and demonstrations explain principles and discuss applications, and provide guided technical solutions in the site theatres, recording studios and music labs. Regular tutorials and seminars explore concepts and monitor progress, giving you the opportunity to practise suggested mixing techniques. You are assessed by a timed practical assessment and presentation. This module develops your skills, knowledge and understanding of mixing and mastering techniques in stereo and surrounds formats. You run a series of recording sessions in which you work with clients to fulfil a client brief, recording a range of acoustic and electroacoustic sources. Using programme material provided by tutors or clients, you create a portfolio of mixes and mastered stereo or surround recordings, in which a range of prescribed creative (and corrective) mixing processes and mastering techniques are explored. The module consists of a short series of seminars on recording session organisation skills, followed by a series of recording studio sessions with real clients. A number of lecture and seminar sessions are included, which cover the issues of working with clients and theoretical aspects of mixing and mastering. The module is assessed through a studio log book and two mixing and mastering exercises. You gain an understanding of music software principles and your application to modern music production techniques. You develop the necessary skills and knowledge to design, create and deploy musical ideas using audio and musical instrument digital interface programming environments. You explore performance techniques and graphical programming techniques in music software systems. You can enhance your employability and professional development. If you choose to become self-employed after graduating, you have the tools to build software devices and production systems, while modern transferrable skills increase your employability in this highly competitive business sector. You can demonstrate acquired knowledge and experience of both graphical programming environments and live performance software. Lectures explain principles and discuss applications. Tutorials provide guided solutions of relevant examples and IT laboratory sessions explore the use of music software. You are assessed by a live performance and coursework. You explore a music technology-related topic of your own choice using our facilities, which is negotiated with your module tutor. Initial tutorials focus on devising your learning outcomes for your study. Once your study is underway, you maintain on online blog to capture your progress. You are supported with regular tutorials throughout the academic year. We prepared you for independent study at Level 6 in the Music Technology Project module. Seminars offer input on study and time management skills and provide opportunities for you to share ideas. You attend regular tutorials to help evaluate your progress and offer formative feedback on practical and written work in progress. You are assessed by a presentation to your peers and a written report of practical outcomes. You explore the theoretical background of and the systems and the techniques used to create and control synthesised sound, both imitative and original. Using state-of-the-art hardware and software in music labs, sound studios and control rooms, you develop skills in sound synthesis, performance control and music programming through the theoretical and practical exploration of a range of synthesis, sound-sampling, audio signal processing and musical instrument digital interface (MIDI) control techniques. You use these skills to create patches, sounds, sonic textures and music that can be manipulated in live performance using MIDI performance controls and controllers. Lectures and demonstrations explain principles and discuss applications. Facilitated practical exercises provide guided technical solutions and give you the opportunity to practise suggested techniques. You are assessed by two coursework components with written and practical elements. You develop your knowledge, understanding and application of digital audio and musical instrument digital interface (MIDI) as a means of creative audio and performance control. You do this using a cross-platform, visual, object-orientated audio and MIDI processing application. Using visual programming, you create a range of digital audio and/or MIDI artefacts (patchers) that can be controlled by MIDI data. Visual programming platforms allow you to create different types of artefacts to understand different disciplines within music technology. Lectures and demonstrations explain principles and discuss applications. Facilitated practical exercises provide guided technical solutions and give you the opportunity to practise suggested techniques. You are assessed by two coursework components with written and practical elements. You develop your technical skills and understanding of creative music production through exercises involving advanced sound capture and manipulation techniques. Exercises include surround sound reproduction, remixing, mix reconstruction, advanced sampling techniques and advanced signal processing, MIDI and video control using a range of software – all in the context of a live event, such as an audio, MIDI or video performance or sound installation. In your lectures and demonstrations you investigate technical issues in site theatres, recording studios, and audio and MIDI programming suites. Regular tutorials and seminars explore concepts, monitor progress and give formative feedback on your work. Your assessment is based on plans for a live performance or installation, which includes research and implementation of a focused performance concept, and the live performance or installation. You are assessed through a written document outlining your performance and a live performance. You put into practice the music technology-related knowledge, skills and techniques learned in previous modules in addition to exploring new areas of interest to support the project objectives. You negotiate your topic for this project with your tutor and use the institution’s facilities. Initial tutorials focus on devising your learning outcomes. Once your study is underway, you maintain an online blog to capture your progress. You are assessed through a presentation to peers and a written project report that assesses practical outcomes and offers a self-evaluation of the experience of independent study. Seminars offer you input on study and time management skills and opportunities to share ideas. Regular tutorials help you evaluate your progress and formative feedback on practical and written work in progress. You are assessed by a practical exam (a presentation to peers) and a written report of practical outcomes. You develop your creativity, technical skills and understanding in creating, editing, producing and post-production of sound and music for video. You work as a team in a group design project to create programme material that is synchronised to video. You develop skills, knowledge and understanding in sound design, dialogue replacement, Foley, music composition and surround-sound capture, reproduction and mixing to create programme material. You demonstrate your understanding of the technical issues involved in creating sound synchronised to picture. In lectures and demonstrations you explore the principles and discuss applications. Facilitated practical exercises provide guided technical solutions and you can practise suggested techniques. You are assessed by two coursework components that contain written and practical elements. You study game audio, investigating the techniques and sound design and their implementation in video game engines. It is now standard practice to use sound design techniques to provide assets for game engines now, to create interactive video games. You explore a range of extended studio techniques and software through peer-led demonstration. You explain and demonstrate a range of studio software and hardware techniques to your peer group. As a practising audio engineer, delivering short technical demonstrations is a common professional activity. You also run student-led seminars and technical demonstrations of advanced equipment and techniques to your peers based on your own research. Lectures explain principles and discuss applications and guided technical solutions. In laboratory sessions you practise suggested game audio techniques. Studio techniques provide a series of self-taught sessions, so you can practise structuring and delivering a short lesson within your field of expertise. You complete your demonstration by providing a short video on your studio technique. You are assessed for game audio is by an assignment and for studio techniques by a practical assessment. You are taught by industry practitioners who help you acquire the skills and knowledge to creatively use the latest technologies. Your study involves lectures, tutorials, laboratory classes and individual or group project work. All modules are delivered in our excellently equipped recording studios, control rooms and music laboratories. Modules are assessed by in-course assessment of a range of music-related media, written assignments and reports, individual and group presentations and live performances. A typical offer is 96-112 tariff points including at least two A levels (or equivalent). Relevant subjects are music technology, music or a science or technology-related subject. We're also happy for you to apply if you're a mature student and can demonstrate your skills and passion for the subject. You're expected to come for an interview. You then receive an individual offer. Our students follow careers in sound and music production, sound capture (sound engineering), live sound production and engineering (gigs, theatre, events), sound design, processing and control, music for time-based media (film, video), broadcast (radio, television, internet), recording artists, music technology journalism and multimedia authoring. A group of enterprising Teesside University music enthusiasts have formed their own record label in a bid to revitalise the local music scene.